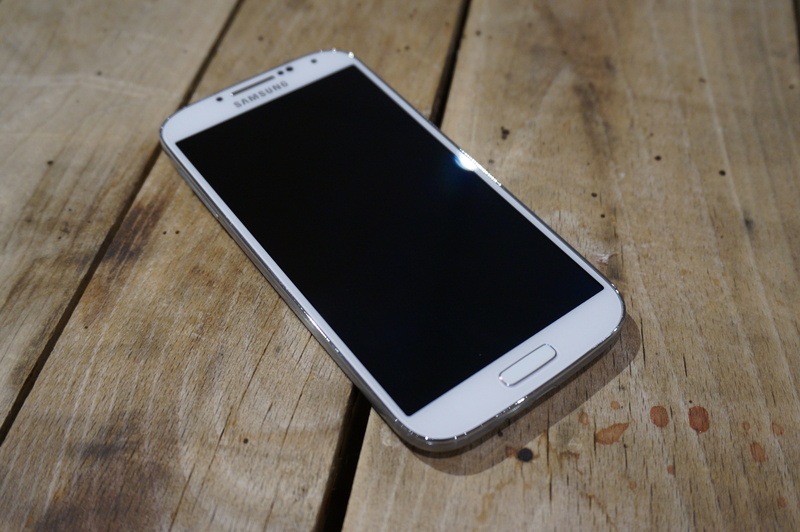 The Galaxy S4 has an easy mode, and more importantly, the Galaxy S4 needs an easy mode. This necessity is a double-edged sword. It means that the technology built into Samsung’s latest generation smartphone does things you’ve never seen before, and maybe couldn’t even imagine. However, really using that technology isn’t as simple as you might think, and could be downright overwhelming to a novice smartphone user. This is the theme I kept running into with the GS4. If you’re technologically advanced enough to be excited for hovering gestures and optical readers and two cameras working at the same time, then yes, you should absolutely jump on the Galaxy S bandwagon. But for those of you who want a phone that works well, keeps you connected, and not much else, be forewarned that the S in Galaxy S4 certainly doesn’t stand for simple. The Galaxy line has never stood out because of design. In fact, many would argue that Samsung has been quite the copycat in the land of design, but the Galaxy S4 represents the first iteration of what appears to be true Samsung design language. It ends up being a mesh of earlier Galaxy S iterations, with a hint of the Galaxy Note and a whole lot of Galaxy S III in there. I can’t say the GS4 is revolutionary by any means. It’s thin and light, just as it should be, and looks pretty meh. It’s made almost entirely of plastic save for a polycarbonate strip that runs along the edge of the phone, and it has a finish that gives the appearance of some texture, but is actually smooth. But you have to hand it to Samsung. Somehow, the company managed to fit a bigger 5-inch display on a phone that actually got thinner and lighter from previous generations. In fact, the Galaxy S4 is almost exactly the same size as the Galaxy S III despite having a larger display. Bravo. The buttons for lock, volume, etc are smaller and more compact than before, which Samsung claims helps with the solidity and durability of the phone’s build. They jut out a bit for you to feel your way to them in a pinch, but they have points on each end, and just don’t feel nice. Along the back of the phone, you’ll see the 13-megapixel camera centered on the top half of the device, in usual Samsung fashion, along with a microUSB charging port on the bottom edge of the phone. The GS4 sports the same elongated home button that we saw on the Galaxy S III, but certainly has a more boxed-out shape than the very elliptical GSIII. Ready yourself, partner, ’cause the GS4 is one helluva rodeo in the software department. To start, TouchWiz (or whatever Samsung is calling it now) has been thoroughly revamped to include a set of smart toggles in the notification center, giving the user what amounts to a cheat sheet of all the features they’d never even guess were present on their smartphone in the first place. In fact, when you first power up the device you’re given a quick tutorial of all the new things the Galaxy S4 has to offer. You’ll also notice that Samsung has done away with the black bar up top, and laid all your notification icons on top of your homescreen art, along with a redesigned Samsung Hub for content, such as movies and books. From there, things get far more complicated, and not always with good reason. Let’s start with the “Air” features, as I believe they’re likely going to be the most valuable and useful to people. Air View, which lets you hover over content to get a preview of extended information, is the latest iteration of technology originally developed for the Galaxy Note II with its S-Pen stylus. This time, however, all you need is a finger. At first mention it seems confusing or overzealous, but Air View might end up being one of the must-have features for phones moving forward. It gives you a window into more detailed information without forcing you to click in and back out again, which is particularly clutch in the case of unread email. Air Gesture, on the other hand, lets you control your phone without ever touching it. Wave to answer a call (which automatically goes to speaker), swipe to scroll up and down on a page or through a gallery of pictures, and you can even set a locked phone to recognize when you gesture toward it to pick it up. This stuff will come in handy when driving, eating, and cooking, though once you’re given the extra freedom of smartphoning with dirty hands, you find it frustrating that Air Gesture is only limited to certain apps like the photo gallery, music app, and browser. Though Samsung’s new Smart Pause and Smart Scroll features seem equally innovative, I hate to imagine a world in which we’re all too lazy to press the pause button, or scroll with our thumbs. That said, I can see how the notion of auto-pausing when you’re looking away during a video, or tilting to scroll might be enticing. But given that these new features don’t work all that seamlessly, and often cause more frustration than they do delight, I’m far less impressed with these tools. Along with building interesting technology right into the system, Samsung has also launched a handful of dedicated apps like S Health, which monitors activity levels through the phone’s slew of sensors, S Translator (complete with live voice translation in over 10 languages) and the Optical Reader, which converts analog text into digital text which can be translated or saved. Of course, the same NFC-based features are still there, giving users access to S Beam and TecTiles fun. There’s also a new feature called AllPlay which lets you play a song from multiple Galaxy S4s at the same time, to take best advantage of all the little speakers. This is one of those features that will rarely, if ever, get used, but on the off-chance that you actually want it, you’ll be grateful to have it. As mentioned before, the phone comes with an easy mode which seems aimed at older generations. It “dumbs” down the phone a bit, removing many of the more complex features and enlarging text and app icons for easier navigation. The Galaxy S4 isn’t the first phone to sport a 5-inch 1080p display, but it still feels like the very first time when I look down into its Super AMOLED wonders. You can’t really argue with a pixel density of 440ppi. Text is crisp and clear, app icons are sharp, and it’s hard to find a reason to complain. I will say that the Galaxy S4 display isn’t quite as bright as the iPhone 5, but color accuracy seems to be pretty dead on save being slightly over-saturated. It’s also fair to commend Samsung once again for fitting this gorgeous 5-inch display onto a relatively compact phone. My thumb did creep past bezel territory and onto the display a few times, resulting in some interesting typos, but I’d gladly trade making a few adjustments to the way I hold the phone given that it’s so much more aesthetically pleasing with that squared-off shape. If we’re just talking hardware, the Galaxy S4 doesn’t have a life-altering, amazing camera. There’s very little shutter lag, which is an improvement, and images do seem to be truer to reality than the Galaxy S III and the Galaxy S II before it. Still, I wouldn’t say it’s a noticeable step above the iPhone 5 camera, except for the fact that there’s no purple flaring issue to be found on the GS4. Where things really get interesting, however, is within the camera app itself. The UI has been adjusted to match that of the Galaxy Camera line, offering a carousel of easy-to-understand modes and a quick toggle for AF, ISO and white-balance settings. The camera has all kinds of fun modes like Drama Shot, which lets you grab hundreds of frames to show a photo of continuous action, like someone walking across the street or skiing down a hill, and Eraser, which lets you remove any unwanted subjects of the photo by detecting movement. You can’t go back and “erase” without having shot the picture in Eraser mode first, which means you have to be actively ready for something to go wrong. And who of us remembers to do that? Still, things like DualCam mode (shooting with both the front-facing camera and rear camera at the same time) seem very interesting. It takes our obsession with smartphone photos to a whole new level by combining two pictures into one. I’m quite pleased that Samsung decided to add more creative and useful features to the camera instead of things like face detection and group sharing features (as the company did with the Galaxy S III) that no one will ever really use. No, the Galaxy S4 U.S. variant doesn’t sport the much-rumored and long-awaited Samsung Exynos Octa-5 eight-core chip. It does, however, run on the Snapdragon 600, which is the latest generation and most powerful quad-core chip out there right now. Plus, the GS4 touts 2GB of RAM, which becomes lethal combined with the Snapdragon 600. And you can tell. The Galaxy S4 is quick like lightning, in almost all respects. We ran the GS4 through Quadrant graphics testing, in which it scored just under 12,000. This is quite impressive, considering its competition (such as the HTC Droid DNA and LG Optimus G) barely broke 7,000. However, the HTC One is the real phone to beat when considering the Galaxy S4, as it’s the only phone we’ve seen that beats out the S4. GeekBench results weren’t much different. The GS4 scored an average of 3,150 out of three tests, putting it well above the average Android phone. 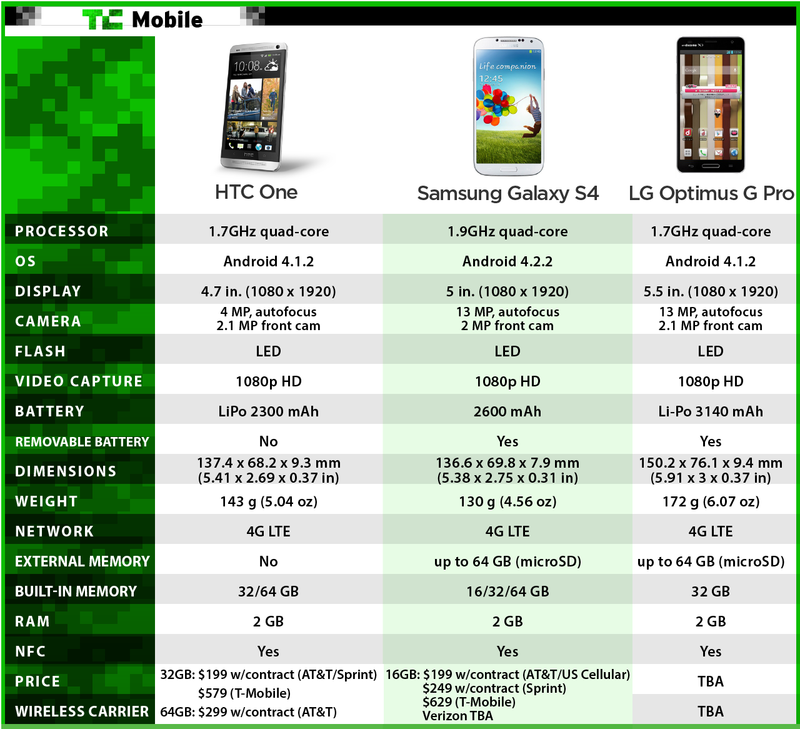 In fact, on GeekBench, the GS4 beat out its rival, the HTC one, which scored 2,728. Still, we can’t measure the GS4 on benchmarks alone. But in any case, I’ve found the GS4 to be snappy and responsive during general browsing, app usage and video watching. Samsung beefed up the battery on the Galaxy S4, opting to use a 2600mAh battery. It has a removable cover, so you can choose to carry along an extra battery for days when you’ll be over connected. I found that the phone lasted with me all day, even with all these crazy software features turned on at all times, and never really failed me once. Obviously, a display like this one just begs to show you videos and games, so I did find myself draining battery more rapidly on the GS4 than I do with the iPhone, which is perhaps a testament to the adage that bigger is better. In official testing, the Galaxy S4 lasted just about seven hours during our battery test, which involves running a constant Google Image search with screen brightness at 50 percent on 3G/4G only. Comparatively, the Droid DNA hung in there for around five hours while the HTC One couldn’t break the five-hour mark. In other words, the GS4 is certainly just as power-efficient as it is powerful, along with having the added bonus of a swappable battery. Win win. That rule seems to have been lost on Samsung. Yes, Air View is a breakthrough, and the camera features are fun and interesting, but anything that requires an easy mode is missing something. Why are smartphones so meaningful to us? Why do we despair when they run out of battery, or paw for them at the sound of a familiar ring tone? It’s because, in a way, they’re magic. They achieve complex technological feats without appearing to break a sweat. But it’s easy to forget about that when we’re shooting a video or playing Asphalt 7, because they’re built to solve and provide for us in a way that we can understand. The Galaxy S4 features are impressive — there’s no denying it. But very few of them work perfectly enough for it to feel natural. Maybe it’s because my time with the GS4 is only beginning (I received it one week ago), but I felt like I was forcing it.